If the heating & cooling products in your Davidson, NC home just aren’t running efficiently anymore, we can repair them or help you install new ones. In order for you and your family to be comfortable year round in your Davidson, NC home, you rely on your heating & cooling products. Sadly, sometimes they let you down or at the very least dip into your wallet a bit deeper than they should in terms of utility costs. If your bills have been inching up, it is tempting to blame the utility company. However, sometimes it is because your current heating & cooling products just aren’t running efficiently anymore. At Cool Comfort Heating & Air, we can help you determine if that is the case and offer recommendations for servicing, repair or replacement that will make a world of difference. Just as your automobile needs regular servicing to keep it running properly, so do your home’s heating & cooling products. We recommend that you have your system serviced twice a year, ideally right before summer and right before winter. In this way, you are less likely to get a nasty surprise when you turn it on for the first time that season, either in the form of a malfunctioning system or an astronomical utility bill. If you have an older unit, you might also consider having it replaced with a new unit. The reason for this is because, over time, the manufacturers of heating & cooling products have been able to make units that are more efficient than they once were. If you get a new unit with a SEER rating considerably higher, you could save 30 to 50% on your heating & cooling utility costs. That savings goes a long way to paying for the new unit. With our various financing options, you could actually save enough to cover the payments. It just makes sense to be paying for equipment that raises the value of your home instead of giving that extra money to the utility companies. 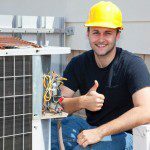 If you would like to know more about the heating & cooling products we offer or any of our services, give us a call to schedule an inspection. If you find your equipment isn’t working, call us anytime, as we offer emergency service 24/7 to get you back up and running quickly.